"Dubai is keen to enhance its role as a global hub for innovative businesses and smart city solutions to improve the quality of life for its citizens and residents," said Majid Saif Al Ghurair, Chairman of Dubai Chamber of Commerce and Industry. "Dubai is keen to strengthen its role as a global hub for innovative businesses and smart city solutions to improve the quality of life for its citizens and residents," said Majid Saif Al Ghurair, Chairman of Dubai Chamber of Commerce and Industry. One of the smartest cities in the world by 2021. He added that the Emirate of Dubai adopts smart transport solutions significantly, as it succeeded in operating self-driving vehicles, in addition to starting the construction of the system of the system "Hyperlop" this year, pointing out that it will be another major step taken by the Emirate to achieve the objectives of Dubai 2021, Enhancing the emirate's role as a center of attraction for business, innovation and knowledge. Al Ghurair, at the Dubai Innovation and Technology Conference, organized by Dubai Chamber of Commerce and Industry, in collaboration with Roland Berger and Intesa San Paolo, Emerging projects and small and medium enterprises in Dubai have been and remain a key part of the Chamber's strategy, one of the pillars of the next phase, pointing out that the UAE and Italy are ideal destinations for emerging companies. The conference will focus on smart and innovative technology solutions for entrepreneurs from the UAE and Italy, especially in the areas of energy and intelligent transportation, as well as enhancing cooperation between emerging companies in the UAE and Italy. "Dubai is a valuable pearl in the Middle East," said Italian Ambassador to the UAE Lipporio Stellino. "Expo 2020 Dubai reflects the values ​​of excellence, beauty and innovation that the emirate of Dubai has to offer. 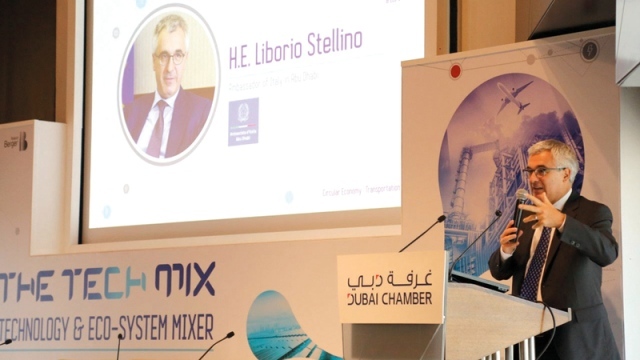 Stelino pointed to the strong relations between his country and the UAE, adding that during the past three years, the value of Italian exports to the UAE about 5.4 billion euros annually, and there is wide scope to strengthen this trade cooperation. He said that the conference is a catalyst for future partnerships and cooperation, and praised the importance of the initiative in creating a new generation working together to meet the challenges of the future. The Dubai Initiative for Emerging Projects, launched by the Dubai Chamber in 2016, is the first of its kind in the Middle East and Africa region under the umbrella of Dubai Smart City and embodies the partnership between the public and private sectors and is a major source of entrepreneurs in Dubai. Dubai Initiatives supports Dubai Chamber's strategy to support entrepreneurs and encourage innovation.